The Pastoruri Glacier is one of the most easily accessible glaciers in the southern part of the Cordillera Blanca. 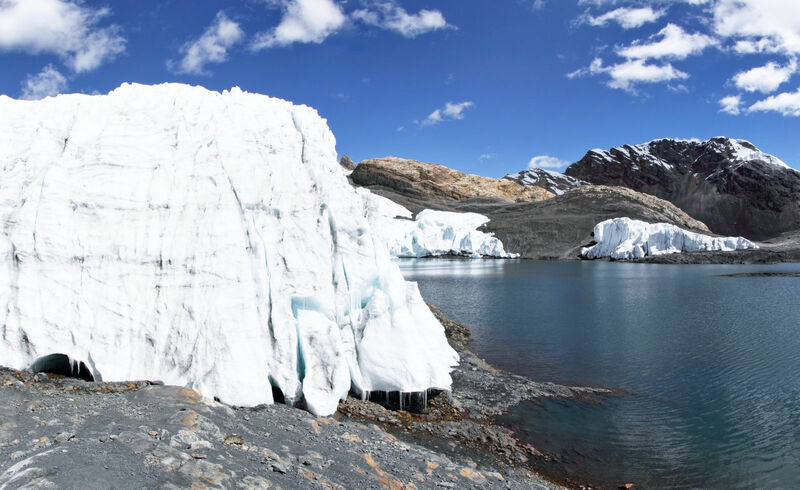 Even though the glacier terminus is located at 5000 m asl., it can be reached through a short and easy trail, which is served by travel agencies from Huaraz on a daily basis. The glacier calves into a large proglacial lake since the early 2000s, and the glacier surface was accessible to visitors through guided tours in the ongoing 21st Century. However, Pastouri Glacier has shrunk at dramatic rates, so that that the lake size has increased rapidly. Even though the glacier surface is not accessible any more, the surroundings of the glacier are still worth a visit. They are more colourful than it would be expected for this rough periglacial environment. You can change the view and blow away the clouds by clicking into the photograph. This time lapse of satellite images illustrates the glacier retreat in the southern part of the Cordillera Blanca between 1973 and 2017. Note that the impression might be distorted due to changing satellite sensors, light and snow cover conditions (both on ground and on the glaciers themselves), so that glacier retreat partly looks less dramatic than it is. Concentrate to individual glaciers rather than to the entire scene. Which of the glaciers is Pastoruri Glacier? You can travel one year forward or backward by clicking on the arrows or into the image. The retreat of Pastoruri Glacier does not only become evident at the scale of decades, but is still clearly visible when comparing the position and shape of the glacier terminus just between two consecutive years. Between 2017 and 2018, the part of the glacier tongue shown on this pair of photographs has experienced both recession and thinning. Also the piece of dead ice in the right background on the other side of the lake has shrunk considerably and will probably have disppeared few years later. Why is this lake so red? The rapid retreat of the glacier front, exposing large areas of bedrock, is one striking feature of Pastoruri Glacier. Another feature is the presence of red-coloured water ponds. Why are these water ponds red? Try to find an answer to this question. If you are unsure, please feel free to develop two or more hypotheses. 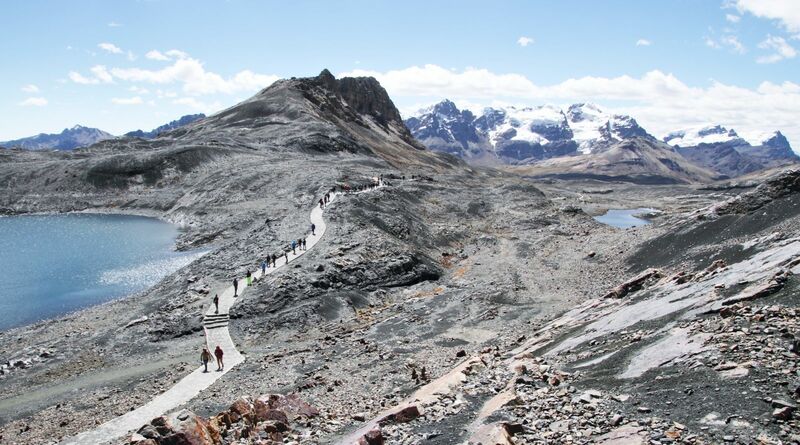 The area around Pastoruri Glacier is characterized by rocks rich in sulfide. When exposed due to glacial retreat, the sulfide leads to a high content of heavy metals and low pH in the surface water. Such conditions favour the occurrence of acidophilic becteria, leading to the oxidation of sulfur and iron. 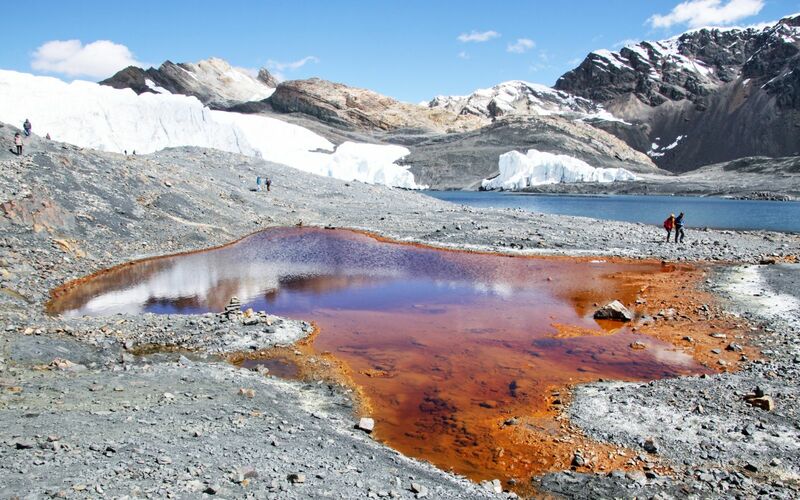 The red colour of some of the water ponds in the glacier forefield is the result of this type of processes.